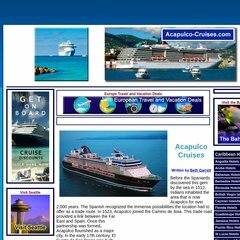 Topics: Beth Garrett, Acapulco Cruises, Alaska Cruises, Amsterdam Cruises, Aruba Cruises, and Athens Cruises. The programming language environment is PHP/5.1.6. Its 2 nameservers are dns2.aspnet.net, and dns1.aspnet.net. It is hosted by Traci Network Solutions Florida, using Apache/2 web server. PING www. (64.139.217.178) 56(84) bytes of data. A time of 51.1 ms, is recorded in a ping test.